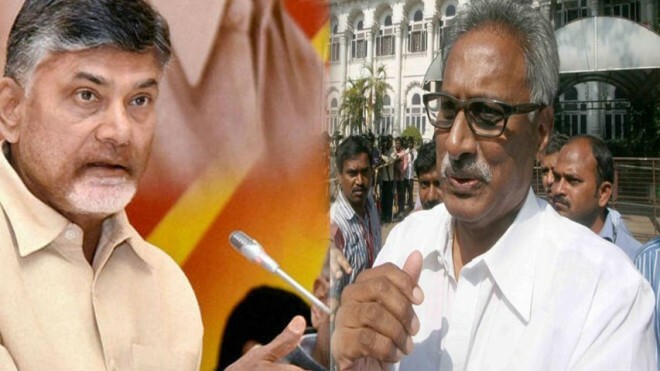 Amaravati, Feb 27: Former minister and Telugu Desam Party founder Sr. NTR's second son-in-law Daggubati Venkateshwara Rao on Tuesday made a strong comment against his co-brother and Andhra Pradesh chief minister Chandrababu Naidu for lack of consistency in politics and policies. Daggubati is formally going to join the YSRCP along with his son Hitesh Chenchuram in the presence of YSRC president YS Jagan in Hyderabad on Wednesday. Daggubati, who has been involved in political antagonism with Naidu since the latter highjacked power from NTR in 1995, told media that the TDP president had known for changing his stand on various issues frequently to suit his political gains. "My co-brother belongs to a strange breed. He speaks something in the morning and a quite opposite thing in the evening. I feel pity for him after seeing the kind of comments people are making against him in the social media. Had I been in his place, I would not have sit in the chief minister's chair even for an hour," Daggubati said. The former minister accused the chief minister of misleading the people with fake promises. "It took 4 years for Naidu to finalise designs for Amaravati capital. What he has been showing to the people is just graphics," he said. He alleged that Naidu was making use of his intelligence department authorities to intrude the Opposition MLAs and leaders. The police were acting like TDP agents, he criticized.